Eventr plugin lets you use your blog as an event management tool. You can create an event – the plugin will let people register for the event – it can also show a list of all the attendees. Once the event is done, you can deactivate the event and no more sign ups will be allowed. One other thing – Welcome to Plugin Week. I am going to release one wordpress plugin each day, every day for one week(ie. Monday to Friday – I’m too lazy to work on Saturdays and Sundays). Each day you will get a new plugin by me. This is the first plugin in this series. 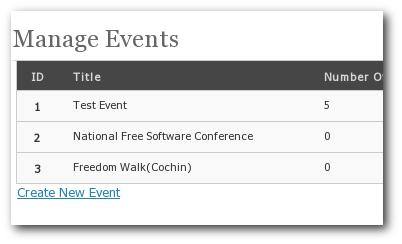 Go to the Events Management page(Tools > Manage Event) to create or edit events. This is NOT a demo page – its a registration for an actual event(Barcamp Kerala 2008) – so please don’t enter your details to test it. That is, don’t enter your details unless you want to register for the event. If you plan to come for the event, feel free to register. If you have any suggestions or notice any problems with the plugin, post it in the Eventr forum. It indeed saved me from a lot of trouble. And Binny, a plugin a day. You should have release this plugin before blogcampkerala. Must have saved a lot of time of Kenny. Great going. Hey, why dont you add email subscription to your blog..? I like subscribing via emails and i cant find a link. This is a feature planed for the next release. Thanks for the feedback. Also try including a feature in which all the registrations need to include a description and email. Also try including a optional feature where an entry need to be moderated before putting up on the list. It would have been lot easier to maintain the list then. Arun, see you at barcamp..
How do I set which fields are required or not? I see the get_option(‘eventr_’ . $opt) call, but don’t know where to assign these vals. Do I need to manually do it via the database? Your plugin is great, but I’ve run into an issue. When I set the bio field as mandatory, and a user enters their info, the plugin isn’t recording the bio field on the admin side. For instance, when I go to manage attendees, and export the list, there’s no bio field data. How can I fix this? I’m not getting any errors and I’m using wordpress 2.6.3. Thanks for your help. Thanks for sharing the plugin-perfect for my need. But it seems having some issue with wordpress 2.8.1 security – I’m unable to create/manage event anymore. It says I don’t have permission to access the page though I’m already have administrator role. Any plan to make it compatible with 2.8.1? I have updated the plugin – try again with the latest version of the plugin. I have the same problem with the latest versión of the plugin and WordPress 2.8.4 ¿What can I do? Any other ideas to fix the bug or did you know an other Plugin with the same functions ??? The plugin is not working with 2.8.2 . If you were using it with 2.8, you will find after the upgrade that the members of the event are missing. I have to downgrade in order to recover the list. So, be ware. What is the short code to list all of the events in one event page? Do I put this short code below in the individual event so that when they select the event it takes them to the event information and the registration form? I would just like a list of the events and the date and information on my events page and then if they click on it it will take them to the event information including the registration form. Please help ASAP. My events are fast approaching! Attendees page says: “No atten­dees found.” even though I have registered with many different names. No luck w/ WP 2.9.2 here either. I get a similar error about not having sufficient permissions to a certain folder when trying to save an event. The Plugin is great! Thanks mate! 1. Mass email to the attendees. 2. Sidebar Widget to get the names of recent added attendees. i tried the same but it is not displaying the events. Is there any shortcode for the plugin?. Event Registration Plugin For Wordpress – CheatAd !